This little kit was bought as a wedding anniversary present from my wonderful wife Jayne and the Russian figures a present from my equally wonderful daughter Lauren for Fathers day. I have to say that its good to have a tolerant family when it comes to this hobby, but its great to have an encouraging family that understands my obsession! OK, onto the kits. The aerosan itself is a trumpeter release. the parts themselves are really detailed and also includes two etch sets and a figure for the machine gun. At first glance the detail seems to be really good and this should build up into a really good kit. Trumpeter have obviously thought about the build of this as well, with the sink marks being constrained to the interior of the vehicle which once constructed should be invisible to the observer. I will still probably fill them though as a matter of habit ! The figure kit is an ICM release, and again I am impressed with the level of detail of the figures for the price paid. At the moment I'm still not sure on the placement of the figures or the theme of the diorama, but I'm hoping that inspiration will come my way as I'm building the kit. I decided to start with the interior of the aerosan. It is very basic in detail, but with only one access door which I will probably have open, there will not be much to look at really. I will therefore build the interior and add further details as if I'm looking through the door opening. One of the first tasks is to fill the mould marks that would be visible through the door with some squadron green putty. I also added some interior re-enforcing strips to one side of the cabin only as you will only be able to see the side opposite the door when the cabin has been built. The strips reflect what has been shown on the outside of the vehicle. These were simply some strips of thin balsa that I had lying around. I have also added the control wires from the steering wheel which I will then route down the front of the cabin. I will also add the three drivers pedals to the floor and some interior detail to the door which are not included with the kit. Hopefully these additions will satisfy the most eagle eyed observer once the cabin is complete and sealed up, with only the doorway for visual access. The next stages is to finish painting and assembling the remaining interior parts, oil wash the interior and then assemble it before masking all of the openings prior to priming and spraying the standard white exterior of the model. I still haven't thought of a placement or setting for this vehicle yet but I remain hopeful! I have also had the initial idea for a diorama setting at last. I am thinking about depicting this vehicle in a little distress having a damaged propeller, with one of my Russian figures removing the old damaged one while another carry's the spare that is fitted to the side of the vehicle. Please be aware that this idea may change, but at the moment that is the way I am heading for the final assembly of this vehicle. Work has progressed quite a lot including a marathon session with the photo etch set that comes with the kit. I was shocked at the shear number of brackets that had to be bent and fitted to the four skids of this vehicle. I am happy with the end result and in all honesty it does make a world of difference to the finished article. Although if you'd have asked me when I was doing them, my answer would have been a different one! The photo etch frame mounts and back plate are also a nice addition to this kit as is the ring around the gun carriage atop the machine. I have also completed the interior by painting the "wood" in a little burnt sienna oil to simulate the wood grain. 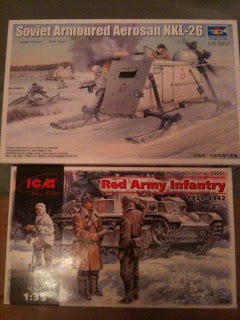 The whole model has also now been sprayed in Tamiya pure white and the major parts have been assembled. If you are thinking about building one of these, I would point out at this stage that I have found a number of articles that point out that Trumpeters issue of this kit (the one that I am doing) is not correct with it being far too long for the cabin length as well as other minor points. I would also like to point out that the articles written about these machines are based on the ones that survived the war and that many of these machines were built at the cheapest price around the country and that there were variations in the size and design. (it was war time after all). What I am trying to say is that the information on the web regarding the dimensions of this model may well be accurate but a version of the machine that Trumpeter have made, may well have existed and that's good enough for me if I don't have to scratch build half of the sodding model for something that "may" be correct !! The base I will be using is a recycled wooden instrument box that was being thrown away in work. I have simply separated the lid and base and cut the lid down slightly in length to suit the model. The lid is covered in fantastic plastic leather! I will be leaving this on the base, as a quick wash in fairy liquid and a quick coat of plastic primer will allow me to do what I like to the surface without any major problems. The following photos show the box lid as I started it, the lid cut to size and finally the lid, primed and a small shaped piece of foam board mounted to the lid before the ground work is started. you will have probably noticed from the photos that the plastic leather has been damaged in the process of removing the hinges and cutting it down to the size that I wanted. If I was going to just simply paint over the leather it would be a problem as these imperfections would show quite clearly. I do however have a cunning plan up my sleeve!What I intend to do is print off some wonderful Soviet propaganda poster images that I found on the internet. These will be scaled down to a suitable size and glued onto the grey areas of the base. I am hoping that this will provide an interesting area to look at other than the model scene, plus its not something that I have seen before and I hope that it looks the part! I have also now completed the build up of the aerosan, save for the gun and propellers. I will be adding some weathering effects to the machine, but will do this once its mounted to the base and the snow that I add to it will be easily blended into the groundwork of the base itself. The next stages for this build is the completion of the simple base and the figures which will probably be the main topic of the next part of this build. I have also chosen the figures that I will be using for this diorama. I opted to use the figure supplied with the kit as my soldier who is already fishing being as he is already in a seated position and would have never fitted into the aerosan upper gun turret. His hands are also in a nice position to be shown holding a makeshift rod and line. I have also chosen the officer and soldier depicted as digging for the other two figures. The officer and digging soldier will hopefully show a second hole being dug while the officer who is looking on while smoking a cigarette is holding the second make-shift fishing tackle to be used once the hole has been dug. For the already opened hole I have taken a clear plastic top from one of my daughters many hair products, cut it down to fit underneath the base and painted the inside of it in a gloss blue. This when filled with some Javis water. Will hopefully give the impression of a deep lake under the ice. The Aerosan vehicle itself has undergone alot of work as well. The additional parts such as the extra prop, weapons etc have been added amd I have also weathered the vehicle as well. For the weathering I had to pay it a little thought. The reference photographs that I found on the net of previously built aerosans show a lot of rust over the entire vehicle, but being as the majority of this craft was built out of wood, how can that be? So I decided to create corrosion around the likely areas of the vehicle such as the mounts for the engine and gun pintel and strengthening beams on the skids. for the rest of the vehicle I have kept the weathering to a minimum with just a very thin black oil wash to give it a dirty appearance against the snow. This is where things also started to go wrong with this build: Whilst talking to my wife and trying to push the prop into the engine, I pushed a little too hard and proceeded to snap the engine off all of its mounts and snap some of the mounts also. A cigarette and a coffee later, I rebuilt the back end and this time fixed the prop in place without any more difficulty. I did not take any photos of this mistake as it was heart breaking at this stage of the build. Why is it that the last stages of the model you are building always goes wrong! I had placed the figures in the positions that I wanted them, drilled out the ice hole for the fishing line to be dropped and then began my "cunning plan". I had previously cut down the lid off one of my daughters many hair products and painted it a gloss blue. This would be glued underneath the hole and would contain the water that I intended to pour down the hole. The lid was glued, the water was mixed and added into the hole. it then proceeded to leak all over my table. In panic and not thinking straight, I then picked up my base and turned it upside down (I don't know why I did this either), the water then poured itself over my nice clean snow and the aerosan as can be seen in the photos below. Resisting the urge to throw the model half way across the room I decided to re-visit it the next day. A quick inspection the next day revealed my mistake. I had in fact glued the lid under the base but failed to realise that the liquid that was going to poured into it would need a water tight seal! SOme more glue and a red face later and it was time to mix some more water. This time I am happy to report that I did not experience any more leaks. The water which had now dried on the snow was painted over as was the snow on the aerosan. I should also point out that I had made some more snow and placed it around the aerosan where I imagined it would be after a fast drive through the snow. The fishing line was dropped into the water and another line put in the officers hand as he talks to the soldier with a shovel and a cigarette. I can now happily report that this model is FINISHED or to describe it more accurately; If I have to touch this sodding thing again, I fear that I will have a nervous break down. Enjoy the photos and let me know what you think.